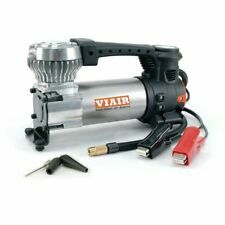 5 out of 5 stars - Viair 88P Portable Compressor Kit w/ Power Cord and Air Hose for Tires up to 33"
21 product ratings21 product ratings - Viair 88P Portable Compressor Kit w/ Power Cord and Air Hose for Tires up to 33"
【VERSATILE AND USEFUL】 This mini-sized tire inflator is a very useful tool to have in your car or garage. It’s so compact then it can be held in your hand. 【EASY AND FAST TO USE】 It may be compact, but it is not lacking in inflation power! POWERFUL DRIVER SUPPORT: Air TIRE INFLATOR can help you keep your vehicles running in top condition. It’s easy to use, you simply plug it into 12-Volt cigarette lighter socket after starting your car and attach plug to the tire you wish to inflate. Color: dark green Material: Plastic shell Voltage: 12V Featured Refinements: Air Compressor Pressure Switch Product Type: Air Compressors Details: Features: *The portable air compressor is suitable to go anywhere. * Fast and easy way to fill your tires. *Powered by vehicle's 12V cigarette lighter. *Great for sport balls, pool toys, air mattresses & more! Specifications: Size: 180x78x250mm Color: dark green Package includes: 1 x Air compressor 1 x Car power cable 1 x Pressure hose 1 x Ball adapter pin 1 x Ballon adapter pin Notes: Please be very careful to check our photos, make sure the photo showed is same as you wanted. If you have any questions, please feel free to contact us. 1 x Portable Tire Inflator. It will shut off automatically at desired pressure. 【 Rapidly inflating】: 27 L/min strong air flow will fast inflate your tires. Power type: point cigarette. 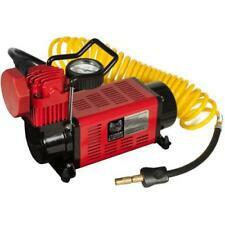 Power: 120 W.
1 x Digital 12V Car Tyre Inflator Pump. It will shut off automatically at desired pressure. 【 Rapidly inflating】: 27L/min strong air flow will fast inflate your tires. Power type: point cigarette. Power: 120W. 300PSI Others Selling 250PSI!!! FULL YEAR WARRANTY!!!!! Kids love bikes and balls, and when they are playing outdoor activity, you can easy take the digital tire inflator car air pump for car tires outdoors. Therefore, you don’t need to worry about the excessive or insufficient tire pressure. Heavy Duty Portable 12V 150PSI Car Tyre Auto Tire Inflator Pump Air Compressor U FEATURES:. 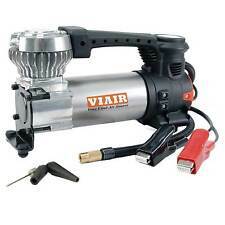 A mini air compressor is very valuable tool to have in hand. Proper tire inflation saves you money with greater gas mileage and tire lift. Saves you a trip to the filling station. 2 nozzle adapters and sports needle with pressure gauge. RYOBI introduces the 18-Volt ONE Cordless Dual Function Inflator/Deflator (Tool Only). This unit also has a deflation feature for fast and easy deflating. Compatible with over 100 Ryobi 18-Volt ONE tools. PART NUMBER / A02743. CPFC2TV3520W Type 0 3.5 HP 20 Gallon Compressor. CPFC2TV3525VP Type 0 25 Gallon Vertical Air Compressor. CPFC2TV3520W Type 1 3.5 HP 20 Gallon Compressor. CPFC2TV3525VP Type 2 25 Gallon Vertical Air Compressor. 5 Gallon Steel Air Tank 9 Ports For Air Ride Suspension or Train Horn Kit. Unless specifically noted, no implication is made that these parts are the original car manufacturers', are from the original suppliers, or are approved by them. ADAPTER SET INCLUDED: Presta Valve for bicycles, Air Inflator Needle and Plastic Tapered Nozzle. 12V-DC Tire Inflator for Occasional Use Only. MULTIPLE USES: Inflate tires on cars, bikes, sedan and midsize SUV. The units are solidly constructed using steel bodies and quiet Direct Drive Motors. It's also great for motorcycles and bicycles. The 16 Ft. coil hose with easy twist brass ensures air is not leaking while inflating the tires. Easy to use, simply plug the DC power cable into your 12V cigarette lighter socket, attach the quick connect air hose to your tire and turn the compressor on. An essential automotive accessory for a car, motorcycle, pickup truck, van, ATV and SUV. Will work with Harley Davidson bikes '09-'17, air suspension. Max air tank size 5.0 Gallon. You Should Never Run An Air Compressor Directly Off The Switch. 40 Amp Relay With Pig Tail. Air Tank Pressure Switch For Compressors. The Item On The Photo Is Exactly What You Will Be Getting. 1 Air Compressor. Make sure you have started your car before switch on the compressor. Be sure to plug into 12 volt outlet with sufficient amperage. It's better to cool it down for 3 minutes after continuous working for 10 minutes. Brand New. 1 Day Process Time. US Seller! Air Tank Pressure Switch. Unless specifically noted, no implication is made that these parts are the original car manufacturers', are from the original suppliers, or are approved by them. Anything sent C.O.D. or without a RA# will be refused. Does your rig have tires 35" or taller?. Tired of waiting to be last in line to fill your tires with your buddy's compressor?. About TUFF STUFF 4X4. The leader in 4X4 recovery gear! (Due to the nature of the product and its intended use, ropes & cables do not have a warranty). WYNNsky 1/4" NPT Lever Style Heavy Duty Air Blow Gun with Rubber & Safety Nozzle, Air Nozzle Blow Gun for Compressor. Rubber tip straight blow guns are perfect to use where leak-proof connection is required when blowing out fluid lines. You Should Never Run An Air Compressor Directly Off The Switch. 40 Amp Relay With Pig Tail. Air Tank Pressure Switch For Compressors. Never get stuck with another flat tire! 3 Gallon 6 Port Steel Air Tank. Two - 1/4"npt Port (one on each end). One - 1/4"npt Port for Drain on Bottom. Gloss Black Powder Coat Finish. 8.25" Tall. 1 x Tyre Air Pump. The appropriate tyre pressure not only save gas but also ensure the safety of driving. Heavy duty double cylinder air pump. The compressor exerts wide ranges of use, such as car, motorcycle and bicycle, balls, rubber boats, etc. EC5 Connector Air Compressor. Compatible For Any Type Of Portable Jump Starter. 5pc Air Blow Gun Kit. 5pc Blow Gun Kit. Punch Flange Tools. The inflation needle is perfect for inflating footballs, basketballs and soccer balls. Tap & Die Sets. This item carries a 1 year warranty on factory defects, but does not cover abuse or misuse of the product. So you’ve decided to purchase an air compressor, and your budget favours buying used over buying brand new. Not to worry. We’re here to help. Whether you’re a committed do-it-yourselfer, or just consider yourself handy enough to tackle small tasks around the house—owning an air compressor can make many tasks easier, and some tasks possible. What Type of Air Compressor Is Right for You? The first thing that comes to mind when you think of an air compressor is a unit used to inflate tires. However that is not the only thing it can do. In the shop, it is also used to run tools such as grinders, sanders, screwdrivers, nail guns, and much more. Of course, having a car tire air compressor is a handy piece of equipment to own, especially when you go out and find you have an underinflated tire. The two types available are single-stage and two-stage compressors. As you would imagine, a single-stage only uses one cylinder stroke while a two-stage uses two—one cylinder compresses the air part of the way and the second cylinder does the final compression. Smaller units only need one stage to get the job done, but larger machines or those used for a consistently long period, benefit from the two stages. The two most common styles are stationary and portable air compressors. Stationary units are larger, hold more air (which keeps it from kicking on and off constantly while in use), and often get installed with the intention of never being moved. 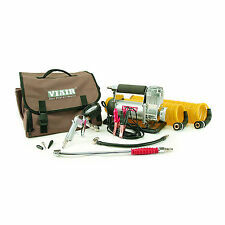 A portable or mini air compressor is made to move quickly and easily from one location to another. The smaller size makes it ideal for the do-it-yourselfer who only uses it occasionally. The two most important pieces of information you need to consider before you make a purchase is the required air pressure and air flow to run your tools. Air pressure is measured in pounds per square inch (PSI), and air flow is measured in cubic feet per minute (CFM). Tools often have these measurements listed as X amount of CFM at X amount PSI. For example, 3 CFM at 45 PSI means you need an air compressor that will give you at least 45 PSI and 3 CFM. If you plan to run multiple tools off one unit, you will need to add up the CFM for each tool. Run your tools with a properly sized air compressor that gives you the power you need to not only get the job done but get the job correctly.